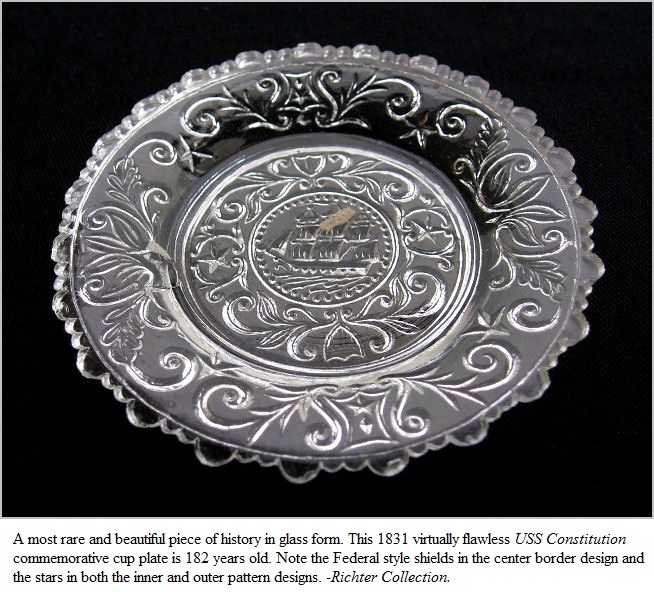 There are only two categories in the genre of antique glass that truly capture history more than any other. The first, of course, is historic bottles and flasks. For most of the Nineteenth Century, presidents, politicians, battle quotes, monuments, any kind of significant person or event, the building of the railroad, clasped hands signifying the end of the Civil War; most anything of a historic nature has been commemorated on a bottle or flask. These bottles and flasks were issued in an amazing array of shapes, sizes, and colors, and are highly sought after by collectors, many of whom pay dearly for the rarest examples. 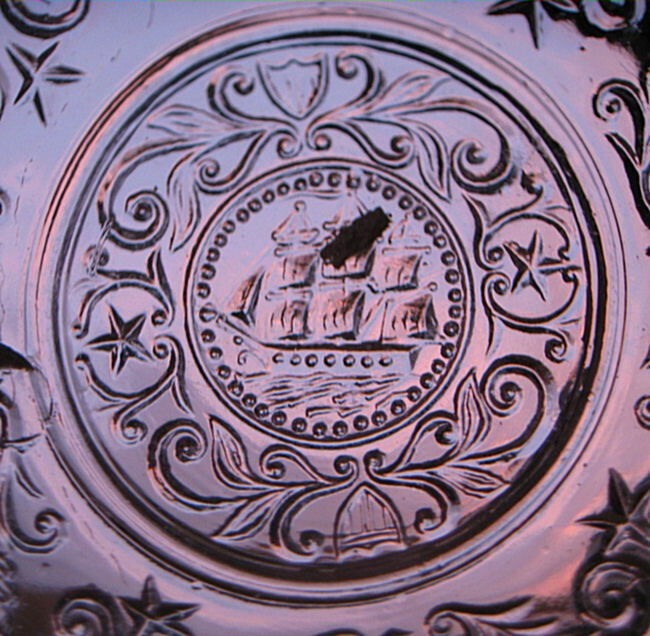 There is a second category of antique glass that’s seen it’s collectibility seemingly fallen by the wayside, despite it’s items being made in the most variety of patterns and colors; both conventional and historic, these patterns numbered in the thousands and also commemorated very similar historical events and people as did the bottles and flasks. What is this second most historical glass category? What are cup plates? Well, basically, they are exactly as stated; small plates one would set a teacup on as not to stain linen or damage fine table wood. 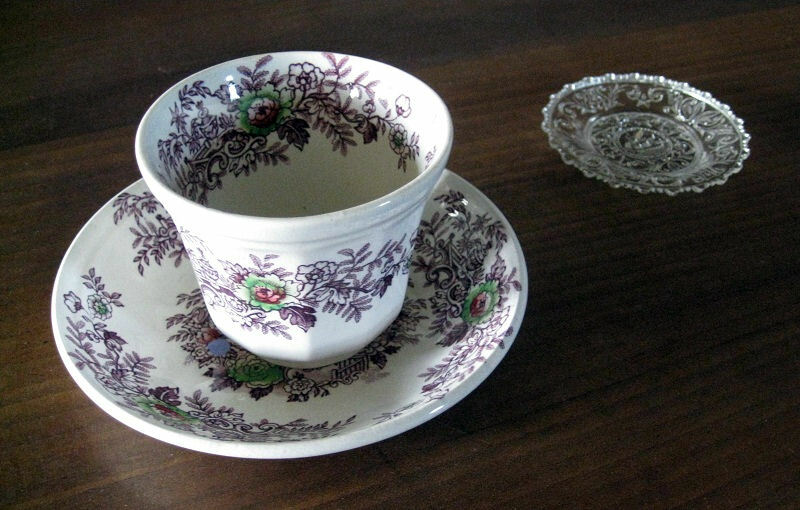 In the early days of our acquiring a taste of the Asian treat of tea, our tea cups had no handles. Instead of drinking tea as the folks from the Far East in thick shallow bowls (that are actually quite similar to ones used today in Asian-American restaurants) we used handle-less cups with saucers that were more bowl-like and when we poured the tea into the bowl-like saucer to cool, it was sipped from there. Because the cup was too hot to be held for long, a place was needed to set the hot cup upon, hence the need for a cup plate. 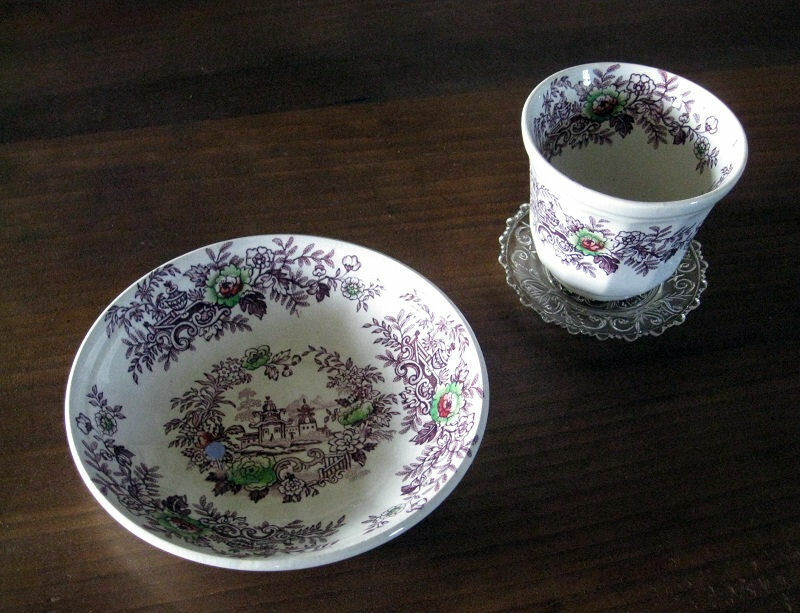 The very first cup plates were made of earthenware, but with the invention of the glass pressing machine in the 1820’s, flint glass cup plates were produced by the thousands. The setting as it would appear with some tea cooling in the saucer and the cup plate protecting the table surface from the hot or wet based cup. The only reason bottles and flasks are placed in a higher category than cup plates for historical purposes is because they outlived cup plates. 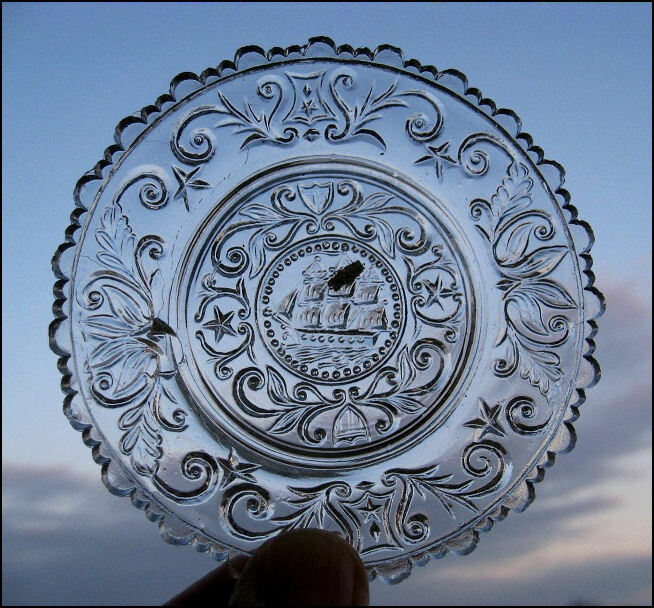 Pressed flint glass cup plates were in use for approximately 20 something years, from the late 1820’s until the mid to late 1840’s. 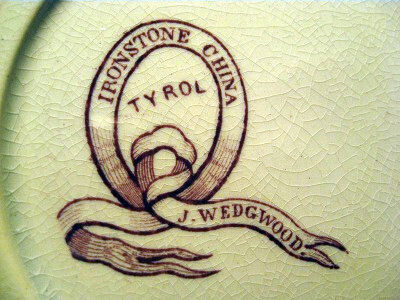 The historical cup plates made during those years depict a lot of the same major historical events as did the bottles and flasks. Historic bottles and flasks were produced from the early 1820’s until presidential campaigns in the 1890’s, right before the machine making bottle process took over. 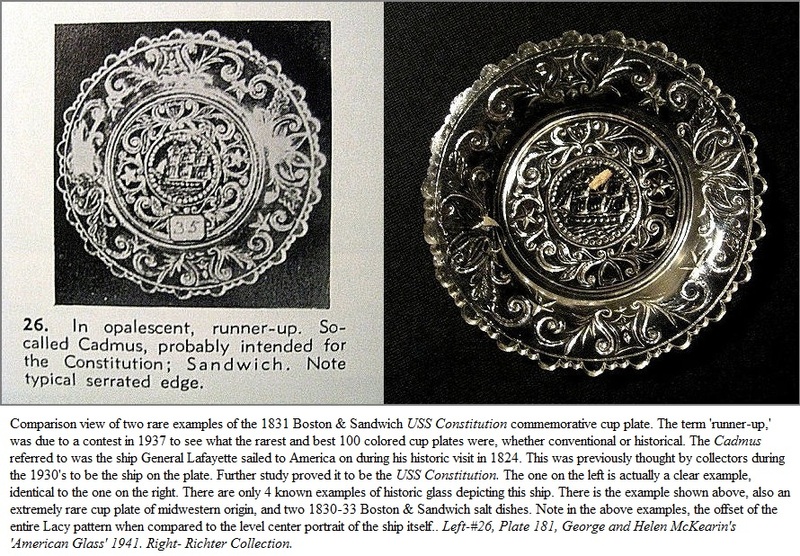 Despite their overlapping in production, what is curious is that some historical events captured on cup plates were not featured on any bottle or flask. Below is shown a most interesting example. In the past 200 years, countless ships have been built, most of which have sunk or been scrapped, razed and broken up, and no longer exist. Just like those ships, countless pieces of historic glass have also been produced and most have been broken or sunk into the ground or both. Let’s take a historic look at one of each that are still with us today. In 1794, in a Boston shipyard, the keel was laid for a most unusual ship which was completed in 1797. 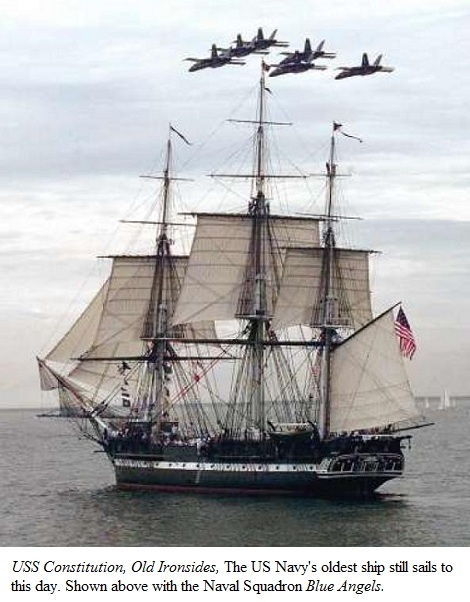 She was named the USS Constitution by none other than Founding Father and first President George Washington. She was designed to be long and narrow, as foreign navies had more ships than our newly founded country, so she had to be fast and maneuverable and built to hold 40 or more very heavy guns. Her side planking was dense southern oak from Georgia, and her sides were 21 inches thick. Her bolts and breastworks of solid copper were forged by none other than Paul Revere. She was some 204 feet long and 43 feet wide. A most beautiful ship. 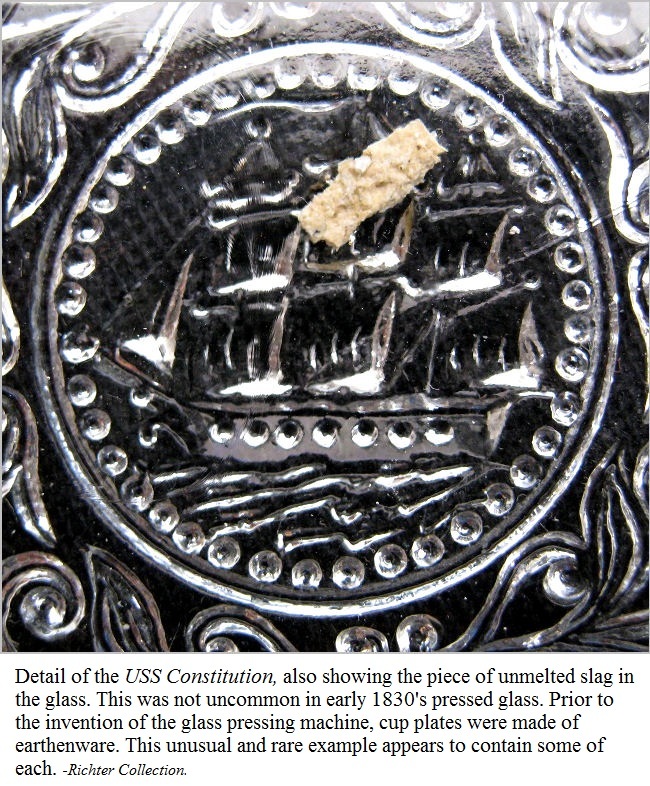 It was August 19th, 1812, when the USS Constitution found herself in the north Atlantic some 400 miles southeast of Halifax, Nova Scotia, when she encountered a British frigate, the HMS Guerriere, who was on it’s way to Halifax for refitting as the ship was badly in need of it; having been taken by the British from the French back in 1806. The two ships engaged each other. 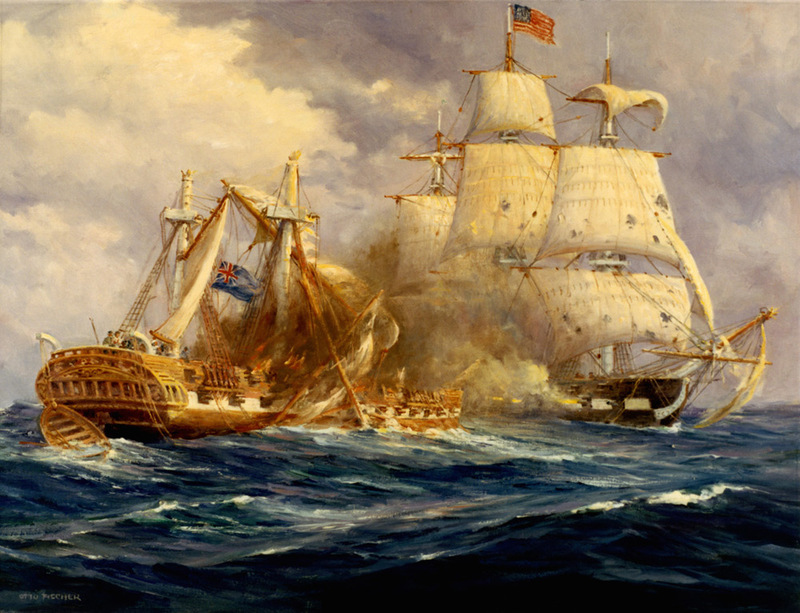 The Guerriere had turned a couple of times and fired cannons at the Constitution, none of which did any damage, but noticing one literally bounce off the ship’s thick sides, an American sailor is reported to have exclaimed, “Huzzah, her sides are made of iron!” The name “Ironsides” would stick with her for the rest of history. 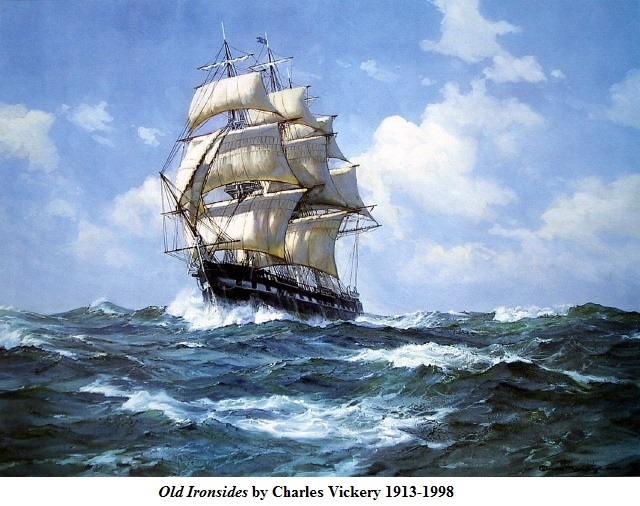 By 1830, Old Ironsides was considered well, old. For a 30 plus year old ship, it was normal for the Navy to render her either to be refitted or scrapped. The estimated cost for refitting was some $157,000.00. At that time, on September 14th, 1830, a Boston newspaper reported in error that she was to be scrapped. The people of Boston were not happy to read this. 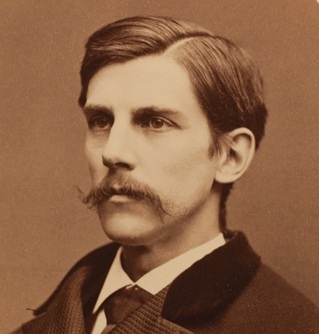 Then only two days later, published in the same newspaper was a very moving poem by none other than Oliver Wendell Holmes. 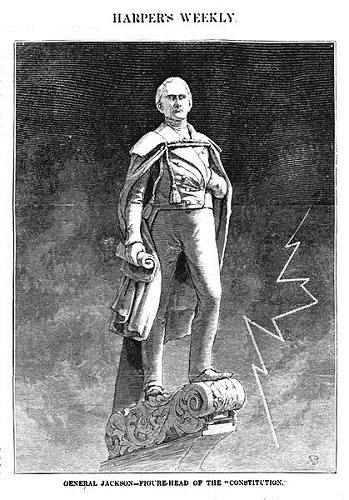 In charge of the refitting and Captain of Old Ironsides was Jesse Elliott, a ‘Jacksonian Democrat.’ This is where things get historically, and hysterically funny, considering most Bostonians at that time weren’t too particularly fond of Andrew Jackson. During the years it took for the refitting, good old Captain Elliott decided a new bowsprit figurehead was needed for Old Ironsides. He unwittingly ordered for the USS Constitution’s bowsprit a full figured likeness of none other than Andrew Jackson himself. This did cause quite a local uproar of sorts and Captain Elliott refused to change his mind and had guards posted at the ship at all times. Once the bowsprit of Jackson was installed, a wager was apparently made, likely over drinks in a tavern. In acceptance of the wager was a local Merchant Captain Samuel Dewey. During a night full of thunderstorm, Dewey rowed to the heavily guarded ship, quietly climbed to the bowsprit and sawed off the head of Jackson. Reportedly, it was bandied about in local taverns and quite a few laughs and other words were heard. Eventually, it was Dewey himself who returned the sawed off wooden head to none other than the Secretary of the Navy, Mahlon Dickerson, who, not being really sure what to do with it, set it on his library shelf, where it remained for years. With the refitting complete in 1835, a miffed Captain Elliott set sail for New York, headless Jackson and all, where he had the bowsprit restored. Throughout her 200 plus year history, she’s sailed almost everywhere and has been refitted numerous times. More recently, in 2010, she was refitted to resemble exactly as she appeared in 1812 when she performed so gallantly in what some historians call, ‘our second war for independence.’ She is docked in Boston, and is fully capable of sailing under her own power and she still does when holiday celebration expects, (especially July 4th) or if the Navy simply wants her to. She’s the oldest commissioned ship in the world and has her own museum not far from her landing. Whenever she sets sail from her dock, she is returned to it facing in the opposite direction so she can weather evenly. She is Captained by her 72nd Commander. Built a beauty in 1797, she’s still a beauty. Two beautiful pieces of American history, both made in Boston. One sits docked there in wood, one sits on my coffeetable in glass. Both make my imagination set sail.